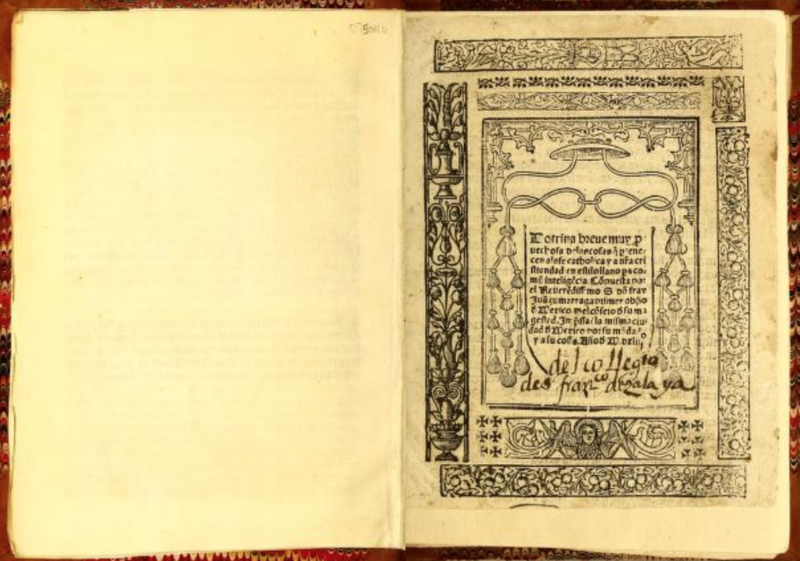 The first book printed in the Americas, from which we have physical evidence, is El manual de adultos printed in Mexico City, Mexico on December 13, 1540. Juan Cromberger printed El manual de adultos as instructed by Bishop of Michoacán, Vasco de Quiroga. El manual de adultos was created to fulfill the mandate of the First Ecclesiastical Meeting in 1539. Only three pages of the text exist today and they are located at the John Carter Brown Library at Brown University in Providence, Rhode Island. There are two other books which bibliographers say were printed before El Manual de Adultos, but as of now, nobody has found physical evidence of their existence. La escala espiritual written by San Juan Climaco is said to be printed around 1536 or 1537 by Esteban Martin in Mexico City. 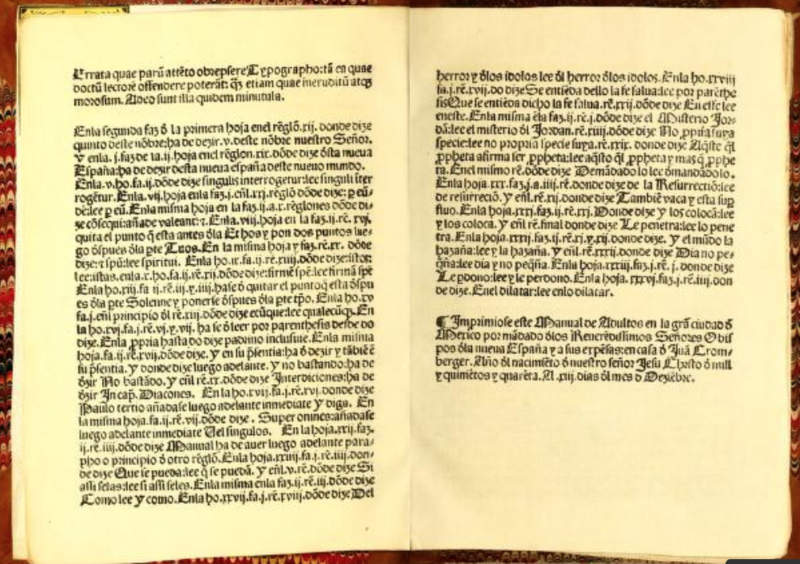 The other book is Breve y más compendiosa doctrina cristiana en lengua mexicana y castellana, printed by Juan Cromberger in 1539, also in Mexico City. De Vivar, Ernesto Torres. Breve Historia Del Libro en Mexico. Universidad Autonoma de Mexico, 2015. Lopez Don, Patricia. Bonfires of Culture: Franciscans, Indigenous Leaders, and the Inquisition in early Mexico, 1524-1540, University of Oklahoma Press; First Edition, 2010. Rechy, Juan Angel Torres. “Edicion Critica y Estudio De La Primera Parte Del Instrumento Espiritual De Cristobal Cabrera.” Salamanca/Universidad de Salamanca, 2015. Alan Gerardo Padilla Aguilar specializes in Mexican and Mexican American history. He has been honored with a State of Texas Joint Resolution for his work with the local community. He was chosen to participate in the Harvard Latino Leadership Initiative program at Harvard Kennedy School in 2013. He was also a research assistant for the PBS documentary, "The Head of Joaquin Murrieta."